Path of Exile has brought banished souls to all sorts of places. Across the oceans, back in time, and to other dimensions—you name it, they’ve been there. So the question is, where to next? Well, how about down—as in way down? For the next PoE expansion, exiles will quite literally be going underground. Be ready to mine PoE items, because this is Path of Exile: Delve. Path of Exile: Delve will be bringing players to the seemingly never-ending depths of the Azurite Mine, giving them the opportunity to uncover its many mysteries. But when they do, they’ll face untold dangers the likes of which have never been seen both in Wraeclast and Oriath. What makes the Azurite Mine deadly as it is obscure is an evil and seemingly alive darkness that has not only swallowed the place for the past 250 years, but also drove the Eternal Empire out of it. The darkness also made venturing into the mine impossible, as it kills anyone who enters. That is until the inventor Nikon built the Crawler. Powered by VoltaxicSulphite, this automatic cart-like contraption is the only machine that can light up the darkness in the mine. Thus, as the expansion’s name suggests, you’ll be delving into the mine with Niko’s work, as well as a lot of your very own courage and preparedness. 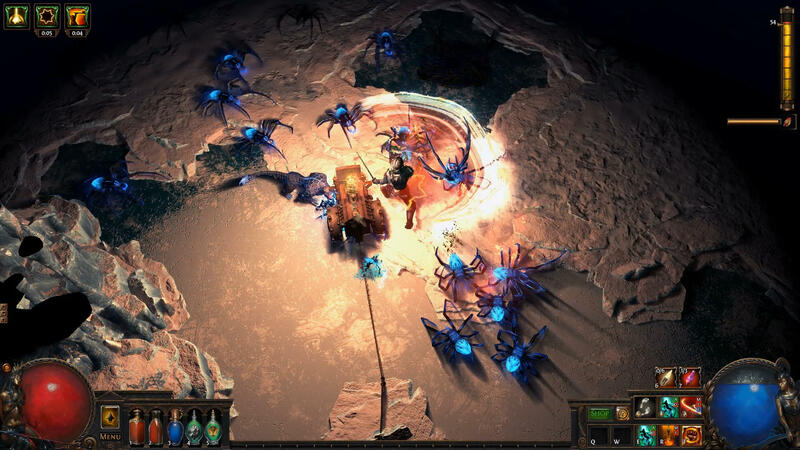 The core premise of Path of Exile: Delve is very much in line with the expansion’s lore: players explore the Azurite Mine, but when they do they must follow the Crawler, as the darkness will deal you damage over time if you stay far away from its light. Don’t worry about not being able to catch up, as the Crawler’s speed is proportional to yours. As you go deeper, the mine becomes more difficult to explore, so to venture further, you’ll have to update the Crawler and other mining gear using the azurite they’ll find in the mines. For example, in order to stay longer in the mines, you need to be able to carry more VoltaxicSulphite at a given time. To increase your carrying capacity for it, you’ll need to use azurite. Other uses of azurite include improving darkness resistance, light radius, as well as upgrading and purchasing flares and dynamites. It goes without saying that the deeper you go, the better POE items you’ll find and the tougher the enemies you’ll have to face. In addition to that, you’ll find a few interesting things on your way down, like packets of hidden rewards or the ruins of an ancient civilization. The devs have even hinted that there is a dragon in there somewhere. Hopefully, you find all these things as you keep going lower. But how low does the mine go? Well, forever. Yes, the Azurite Mine is the first-ever infinite dungeon in Path of Exile. And since you can keep going down and down and the mobs get stronger as you do, it’s no surprise that you’ll eventually come to a point that you can have encounters that are tougher than the end-game maps. Be ready. With everything that’s been said, it’s pretty obvious that Path of Exile: Delve has enough surprises to make you not mind seeing the sun for days on end, be it in real life or in-game. Unfortunately, the latter is impossible, as VoltaxicSulphite is found in regular maps. And since VoltaxicSulphate is consumed, you’ll have to return to the surface from time to time. Then again, that’s just how it is in the mining industry: you can’t stay underground forever. Once Path of Exile: Delve rolls out, we’ll all be burying ourselves in its rich content and unearthing its myriad secrets. So, when will we start? Currently, the countdown isn’t on yet, but it’s definitely soon, so be ready to say goodbye to your life aboveground a few days from now.